With Britain marking the 70th anniversary of the foundation of the NHS, a new YouGov survey can reveal that 87% of Brits are proud of the health service, making it the second most popular British institution behind the fire brigade (91%). With the nation having also recently celebrated Armed Forces Day, the survey shows the armed forces in third place with 83% of Brits proud of the nation’s defenders. (Please note, the survey was conducted prior to Armed Forces day). 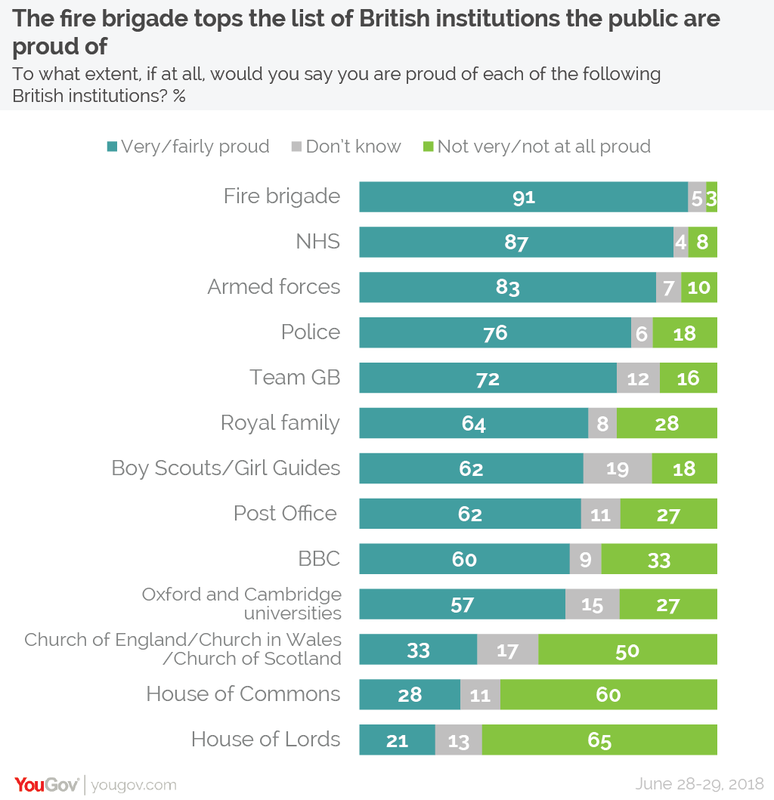 Other institutions that large proportions of Brits are proud of include the police (76%), Team GB (72%), the Royal family (64%) and the BBC (60%). The Houses of Parliament sit at the bottom of the table, with only 28% of Brits proud of the House of Commons and 21% proud of the House of Lords. What have you done today, to make me feel proud? Age is one of the key factors in whether or not someone is proud of one of the institutions listed. The biggest difference between the generations is over the Boy Scouts/Girl Guides – as many as 85% of Britons aged 65 and older are very or fairly proud of the institutions, more than twice the proportion of 18-24 year olds who say they are (42%). 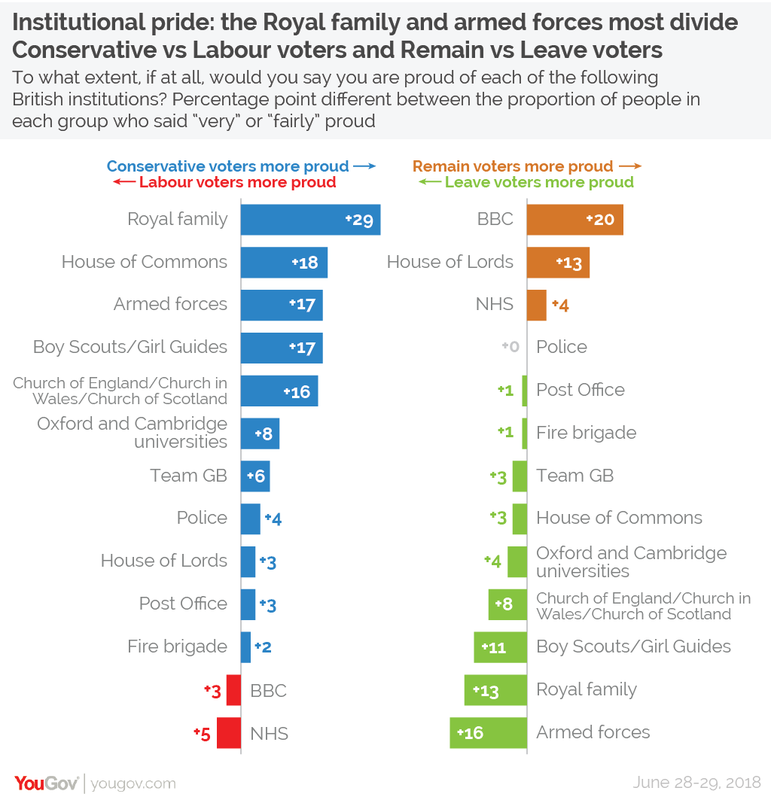 Similarly, older people are noticeably more likely to be proud of the Royal family (82% of 65+ year olds, compared to 61% of 18-24 year olds), the armed forces (93% vs 78%) and the Church of England/Church in Wales/Church of Scotland (43% vs 29%). The institution that younger Brits are most likely to be proud of compared to their elders is the BBC (70% of 18-24 year olds vs 61% of those aged 65 and older). Politically there are big splits too. The biggest difference in pride levels between Conservative and Labour voters are over the Royal Family (84% of Conservative voters are proud of them, compared to 55% of Labour voters), and the House of Commons (42% of Conservatives vs 24% of Labour). When it comes to Remain and Leave, the top divisions are over the BBC (71% of Remain voters compared to 51% of Leave voters) and the armed forces (93% of Leave voters vs 77% of Remain voters).